MINUTES FROM WINE COUNTRY AND GOLF! 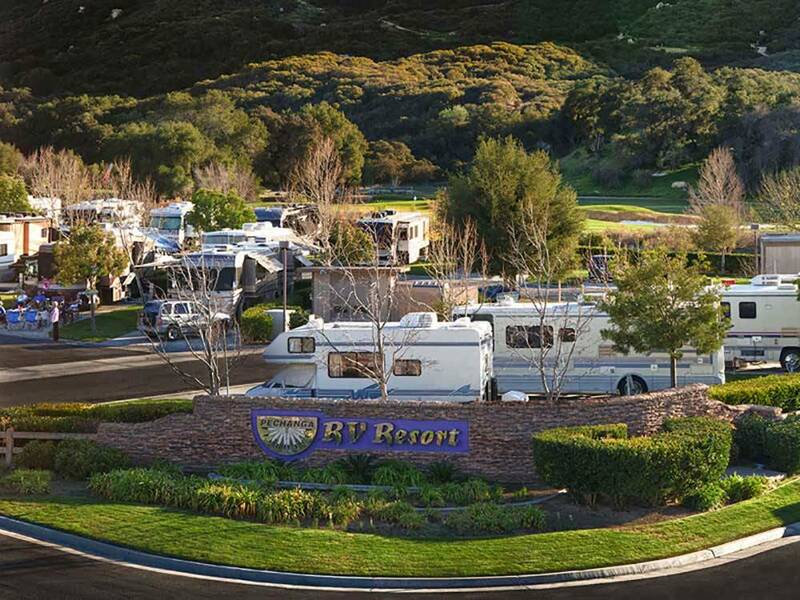 Nestled in the picturesque hills of Temecula Wine Country, the award-winning Pechanga RV Resort offers guests endless opportunities for excitement, relaxation and fun! Wine tasting, casino, golf, Historic Old Town and more! Wonderful resort! First class everything. Had a great meal in their steakhouse. Will definitely stay here again! I gave Pechanga an overall 5 star rating just because we enjoy being here; it may be a bit high. Check in was easy and you can save a few dollars with a Passport America membership - we stayed a month and saved a lot by joining. Finding our site was easy. We wanted a pull thru but they wouldn't give us one because we were staying 29 days - that's the maximum anyone can stay. If you want to stay longer you need to leave for a day and come back. You can park/dry camp in their parking lot. They said this is because they don't have residents - something with CA law. Roads are paved and adequately sized to turn into sites. Sites are concrete and fairly level. We have stayed here in a pull thru site and found it adequate. This time we found a back-in rather tight. Our car just made it on the site. When our family came to visit parking was a problem. The office told us to have them park in one of the parking lots and take a shuttle to us. Our daughter just had a baby so this was not possible. We managed, but found this suggestion off-putting. Other than the small sites, (our coach is 34'; not sure how you'd fit with a larger one and a car/toad), we still love this place. Pool is lovely with two hot tubs; shuttle service is outstanding; several restaurants to choose from; gas station right there, with propane. Decent dog park, often no poop bags; plenty of grassy areas to walk a dog though. Weekends are particularly busy and holidays are crazy-busy, with lots of families and children around. Hook ups were fine, but cable did not work well - did complain and supposedly they sent someone to fix it but we had few channels with poor reception throughout our stay. Internet wasn't bad. Restrooms were clean. There is a ton of construction going on - they offer ear plugs at check in. Will be staying here again in the fall and again asked for a pull thru. Apparently the rules changed and we can get this kind of site for a long stay but of course they are booked for part of the time we'll be there so we're on a wait list as we'd rather not have to move. Also of note is the location. There are a ton of things to do in Temecula, with a huge variety of eateries in all price ranges. We find this part of the fun of staying here. Yes, Pechanga is pretty expensive for a campground, but it is spotless, very beautiful, offers lots af amenities, and generally a wonderful place to stay! This resort is very hard to make a group reservation at. They will only allow one group at a time. This is a new rule. Lots of black out dates too. The rates keep going up and they keep changing how they charge for the different sites. This use to be an easy park to deal will. The staff keeps changing the rules. I guess they are so good now they don't need any business. That is how their attitude is. We will take our club business somewhere else. We stayed 3 nights to see some of the sights in the area. The park is a little bit of a drive from I-15 (CA-79 Exit) along busy multi lane city streets. After getting to the casino grounds it was a little bit of a challenge to reach the park due to the construction and poor signage. Once at the park, it required a few tight turns to reach the registration parking. The interior roads are paved. The interior roads and turns are sufficient to maneuver larger RV’s. The sites are a mixture of back-ins and pull thrus. The parking pads are concrete. The P/T sites were long enough to say connected to a toad. Sites had sufficient room for opening slides. This park seems to understand the simple concept of the importance of a flat, level site as the sites were generally level and flat. Some of the sites appear to be extended stay sites. Distance and grassy areas establish privacy between the sites. They have full hook ups – water, electricity (50/30/20 AMP), & sewer. The sewer connection was at the ground so it was easy to establish a downhill flow. “Standard” sites did not have an outside table and there were no fire pits. There were quite a few trees scattered throughout the park and around the perimeter so satellite reception would be dependent upon your site. The park information didn’t mention anything about cable or broadcast channels. Didn’t try to get any broadcast channels. The park provided WiFi was difficult to connect to as the login page would not load. Had to enter the page address by hand. Once connected, the service was acceptable. It was password protected. Our Verizon WiFi hotspot worked well. Didn’t try the NET10 phone so don’t know about cell phone reception. There was one designated fenced pet areas with a grass surface located in a corner of the park. There were bag dispensers and collection stations for waste in the fenced pet area. There was sufficient area to walk dogs along the park’s roads. We would probably stay here again if traveling through the area. TIP: Premium sites along the “I” row have a line of tall trees between them and the Southern sky so satellite reception would be impacted in this area. Didn’t like having to pay $5.00 pet fee per pet per week. We used the hot tub & laundry. Laundry cost was $1.75 for wash & dry each. The machines were efficient, clean and convenient. There was a shuttle to the casino but it was close enough to walk if you wanted some exercise. This was the first time I've been to this resort and i absolutely loved it. Their restrooms are very clean as well as the rest of the resort. Also the faculty members were extremely nice and welcoming. The campsites were spacious. I also liked the shuttles that would pick you up from your campsite and takes you wherever you want to go, like the Pechanga Gas Station store to get a quick item, and the casino. There is no hassle in driving your car around to get the necessities. 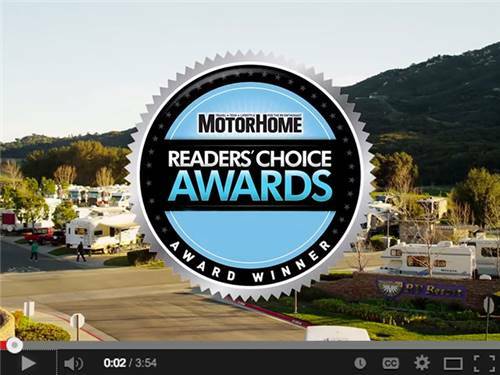 This is a very nice park for motorhomes. The sites are well done and the staff is outstanding. Proximity to hotel/restaurants is a big advantage and shuttle service is directly to and from your campsite. On a negative note, construction is underway for a new hotel and the construction noise and activity will be big problem for a year or so. The weekends draw some noisy, boisterous campers...unlike non-casino rv parks. This place is awesome! Big sites, quiet, well ran, clean bathrooms/showers and a great pool spa area as well as laundry. I'd highly recommend this place to anyone wanting a place to stay for a night or a month! One of the best California spots we've stayed! I hate this place, if you like your peace and quiet, don't go here. We stayed on the east border of the facility, last night. There you hear prarking lot traffic 24 - 7. After a night of very little sleep, because of traffic noise, at 700 AM today jack hammers began pounding in the nearby parking lot. Then tractors are tearing up the field on the other side of the resort! When I complained about the noise, I was offered another site. But, no refund for the 2 remaining nights I paid for, but didn't want. We stayed here for one night on our way to San Diego. The signage to enter the rv campground with a large motorhome and tow car is terrible. I would hardly call this a resort, the spaces are really close together. There was dog poop on our site. GROSS. We went to the buffet; we found the crab legs were mushy. Oh well. I will say that the shuttle to and from the casino was very convenient. Don't think we would stay here again. On this particular trip we spent 4 days at this resort. There is a lot to do at the resort and in the surrounding area. The bathrooms were very clean and the resort well kept. There is one pool and it can get crowded on hot days. While the cost is more than other parks it should be noted that the shuttle will take you anywhere on the premises(i.e. Casino, restaurants, golf course, store) free of charge. Wine tasting is about 15 minutes away with multiple winery's in the area as well as old town. The staff is very courteous and helpful also early checking is available if you spot is open. The spaces are roomy and there are different prices based on size. The staff does have to check your sewer connection for the proper 90 degree fitting. We stay here at least once every year. We attended a conference at the casino and rented a motorhome from Camping World to stay at the RV resort while at the conference. It was so convenient. The park is super clean and so are the bathrooms. Security quietly patrols the park which is nice because it is set in a somewhat remote location. We brought our dogs which are not always well-behaved. In fact, we got a few complaints from other campers. The staff handled these complaints very well and didn't make us feel unwelcome; they were very nice about relaying the complaints to us and gave us advice on how to be better neighbors. I would stay here again. Although this is a 5 star resort. The price they charge for staying here with even a large group is highway robbery. I have stayed at, if not equal, but better for a tenth of the price. I will say that i will never stay here again. Let them keep their resort with the high price of hilton.